Justinian I. 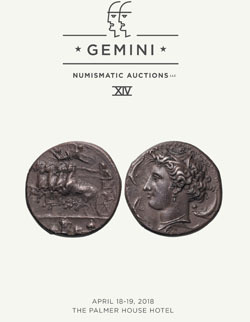 527-565 AD. Solidus, 4.48gg. (6h). 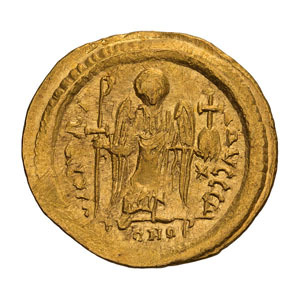 Constantinople, c. 542-565 AD. 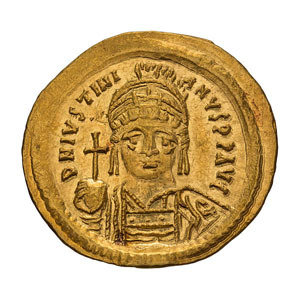 Obv: D N IVSTINI - ANVS PP AVG Helmeted and cuirassed bust facing, holding globus cruciger and shield. Rx: VICTORI - A AVGGG Δ Angel standing facing, holding long cross terminating in Christogram, and globus cruciger; to right, star; in exergue, [C]ONOB. Berk 44 var. DO 9. MIB 7. Sear 140. Mint State. Ex Waddell Auction 100, lot 3.